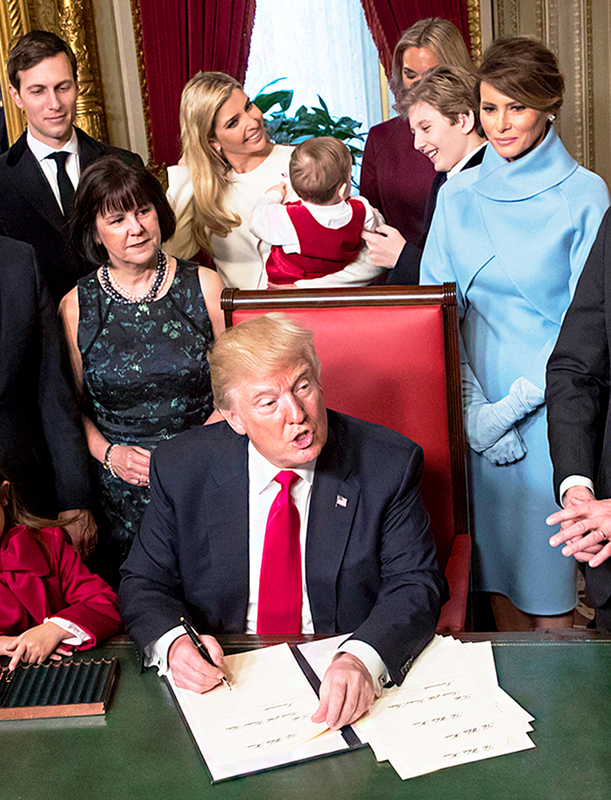 Barron Trump took on the role as doting older uncle on Friday, January 20, keeping his baby nephew, Ivanka Trump&apos;s son Theodore, occupied while dad Donald Trump signed the formal nominations for his cabinet picks after being sworn in as the 45th president of the United States. Watch their sweet interaction in the video above! As Trump’s family and cabinet picks gathered around the new commander in chief in the President’s Room at the U.S. Capitol building, 10-year-old Barron was caught on camera standing behind the president and playing peekaboo with the 9-month-old. The cute uncle moment gave viewers a glimpse of Trump’s youngest son’s personality. The 10-year-old, who was absent from Trump’s Make America Great Again concert yesterday, previously made headiness after he struggled to stay awake during Trump’s early-morning campaign victory speech this past November. The youngster also made the news after his mom, First Lady Melania Trump, threatened a lawsuit after a YouTube user suggested that Barron was autistic. It’s unclear how often America will actually get to see Barron alongside his famous father. As previously reported, First Lady Melania Trump and Barron will remain living in New York City until the end of Barron’s school year.